Actually the graph is showing an economic balance which one particular pipe diameter gives the least total cost including the cost for pumping the liquid and fixed charges for the installed piping system. The pumping cost is increased with decreased size of pipe diameter because of frictional effects, while the fixed charges for the pipeline become lower when smaller pipe diameters are used because of the reduced of capital investment. 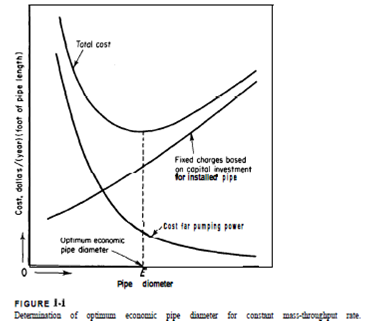 The optimum economic diameter is located where the sum of pumping cost and fixed cost for the pipeline become a minimum (the least Total Cost) which represented by E.
This topic is also covered under Engineering Economy 15th edition, chapter 2.1.6 Life Cycle Cost as refer to a summation of all the cost related to a product, structure, system or service during its life span which can be divided into two general time periods: the acquisition phase and the operation phase. Why use Life Cycle Costing? The determination of costs is an integral part of the asset management process and is a common element of many of the asset manager’s tools, particularly Economic Appraisal, Financial Appraisal, Value Management, Risk Management and Demand Management. Both the capital and the ongoing operating and maintenance costs must be considered wherever asset management decisions involving costs are made. This is the Life Cycle Cost approach. How is The Life Cycle Costing Process? As refer to the New South Wales Treasury under the TAM04-10 on September 2004, the LCC process is typical what we have on the Project Life Cycle. All stages may be performed iteratively as needed. Assumptions made at each stage should be rigorously documented to facilitate such iterations and to aid in interpretation of the results of the analysis. LCC analysis is a multi-disciplinary activity. An analyst should be familiar with the philosophy, which underlies Life Cycle Costing (including typical cost elements, sources of cost data and financial principles), and should have a clear understanding of the methods of assessing the uncertainties associated with cost estimation. How do I use in Oil and Gas Business? System optimization during the engineering phase. Modification projects and optimization during operations. Equipment and materials purchase cost. Spares and consumables consumption cost. This entry was posted in Candra Nugraha, Week #2, Weekly Submission. Bookmark the permalink. You didn’t make any recommendation as to which of the alternatives was best (and why) nor did you explain how you would monitor the results if management were to accept your recommendation. So I will accept this weeks posting, but for the future, I would like to see you following the template shown in Table 1-1 more closely. (I am happy with either problem or opportunity statement) But I am would encourage you to follow the full 7 step process. When it comes exam time, you will thank me for making you do this!! !